I am so excited to announce that http://www.ohthesimplejoys.wordpress.com has completed it’s move to http://www.ohthesimplejoys.com! It’s one more tiny step towards my dream, which began when I was pregnant almost 2 years ago! A huge big thank you to Bodie who made this move possible, set up my new hosting, made it so the pages load quickly, and answered all of my (seemingly endless) questions patiently and lovingly. If you were signed up for e-mail updates before, you should continue to get them. If you haven’t already done so, you can put in your e-mail at the bottom of the page to subscribe. What’s next? More collaboration I hope, more learning, more sharing, more community building, relationship building, and love building. Thank you all and go check out the new site! Respect your kids – don’t sneak them fruit and veggies! How do I get my kid to eat fruits and vegetables? I read this answer for the zillionth time today and thought about why it was bothering me. Would I want vegetables hidden in my food? Would I hide them in my spouse / partner’s food? I tried making Bodie a green smoothie once and he was horrified when I told him that there was spinach in it and refused to take another sip. He felt betrayed, and rightly so, hiding vegetables is sneaky and not nice! Beyond that, hiding fruits or vegetables encourages children to be picky eaters. It says “vegetables are bad and worth being sneaky and manipulative about”. It does not create a culture of healthy food being delicious and desirable, it creates a culture of healthy food being something you tolerate, begrudgingly, and hopefully hidden in something sweet. So how do you respect your child and make sure they are getting good nutrition? This makes me think of a documentary that I once saw that had a French school in it. The children ate all kinds of food, lentils, carrot soup, crusty baguette, beef stew. Why was this? My theory is that it is because most French children are continuously offered delicious vegetables and foods from birth. If a child learns, from birth, that vegetables and fruits are a normal part of their daily life and that they can be prepared well using high quality ingredients, there is no reason to dislike them. Our distaste of an entire food group comes from poor ingredients and poor preparation. That is not to say that every toddler will eat every vegetable at every meal, but it’s a good start. If your child does refuse fruits or vegetables, keep trying. Offer them with every meal, prepare them in different ways, use a variety of produce and DO NOT PUSH, just put it on the plate. This is especially easy if you are doing baby led weaning, which already incorporates these principles into it’s method of feeding children. Whatever you do, don’t trick your kids, don’t make them think that veggies are only good when they are covered in fruit juice or sugar. If they learn to enjoy them when they are young, they will carry that through their teen years and into adulthood. Treat them the same way that you would a friend you are offering a new food too, let them explore it, make it available, and don’t be forceful or manipulative. Bit by the “Curriculum Bug”? Put it to Good use! Most homeschooling Moms, especially new ones, can attest to the fact that every once in awhile you get bit by the “curriculum bug” and suddenly feel like you should be doing more, planning more activities, having more structured learning time. Since I believe in parenting by instinct, but I also don’t believe in forcing a curriculum on a child, I respond to the urge to DO these activities by offering them to my daughter, and seeing where the learning takes us. The unschooler voice in my head whispered “she was learning, she is so much more personally interactive, social, talkative… she has learned several new words each day and is starting to form sentences”…but still, I was bit by the DO bug and there was no going back. I kept it low key, drew a few triangles on a page, showed her what they were, that they had three sides, what the word triangle looked like. I thought about spending a week focusing on “triangles” and finding them all over our house, nature, building them out of dried macaroni, etc. At about the third triangle, Miriam was done watching. 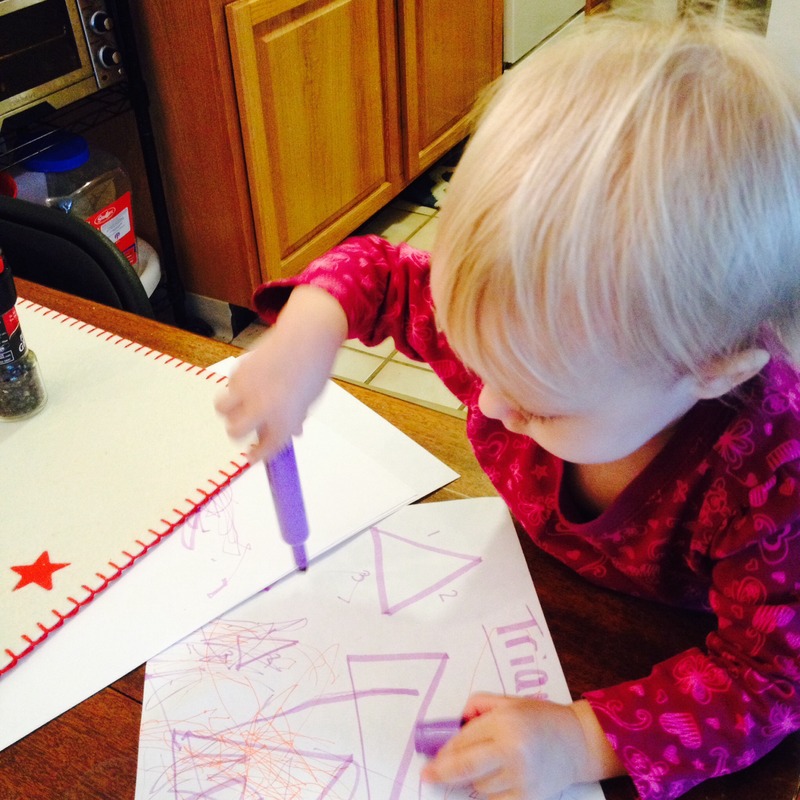 She grabbed the pens out of my hands and started to draw on the triangles. Trying to save my “curriculum” I drew two or three more triangles. She drew on those too. Then I let go, let her scribble sat back and enjoyed watching her. What I noticed is, recently she has been focusing her coloring on top of things I draw. Not really “in the lines” (like I would ever force coloring in the lines)… but definitely drawing on my drawings. She even used two colors to draw on the same spot, filling in that area fairly well. She learned to put the caps back on the markers, so her fine motor skills are building! Today she shoved a chopstick through the hole in a cheerio. 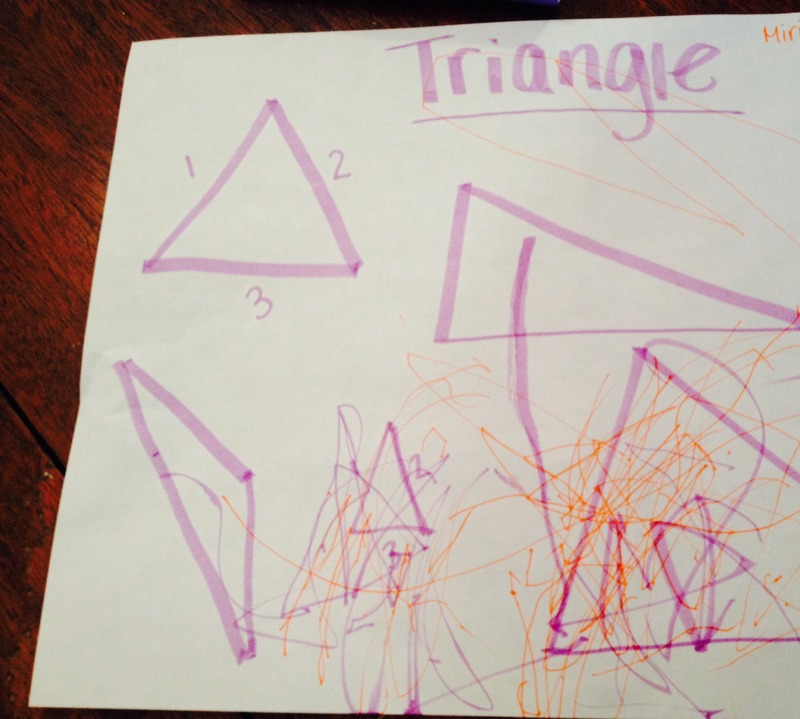 I will not fill her week with triangles, I will not force her to do fine motor exercises. I will enjoy her and will give her objects like chopsticks and markers and cheerios to play with. Maybe she’ll learn some more new words. Maybe we’ll just run around and play . It’s up to her, and as long as my curriculum bug stays out of her way, she’ll do just fine. After much research, I felt like there were two choices, bed share or cry it out. I was determined not to do either, and so I found a way that worked for me. 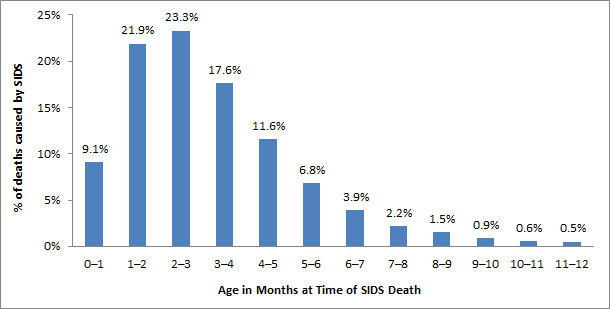 I did want to co-sleep (or share a room with) my newborn, and I was concerned about the dangers of SIDS and of suffocation that bed-sharing posed for a newborn. 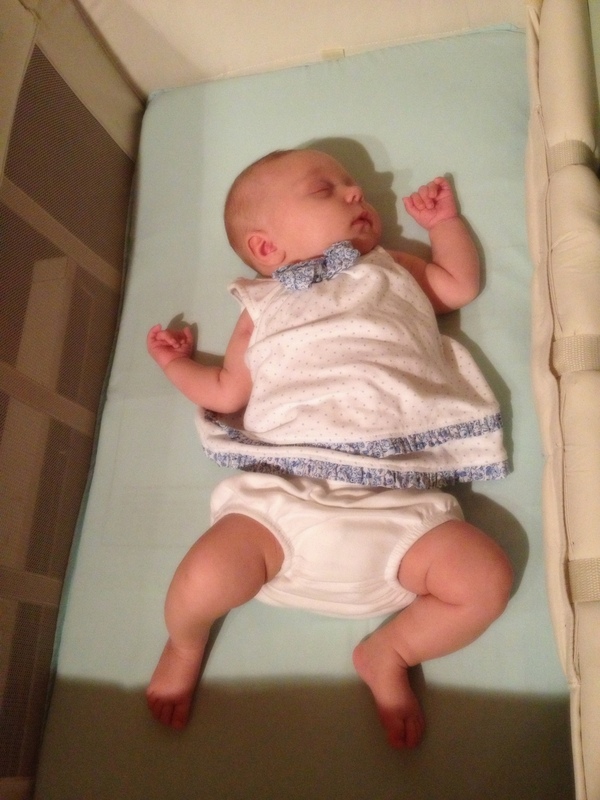 We chose to start with a co-sleeper bassinet, which is a bassinet that attaches to the bed. The cosleeper made night time nursing easy, and I felt safe in knowing that Miriam had her own firm little mattress free of suffocation hazards or the risk of falling. Proof that she slept in the bassinet! The cosleeper was great, but it was never a permanent solution since it was a bassinet, and bassinets have short walls and a low height/weight limit. They are designed for newborns, not for “all of babyhood”. 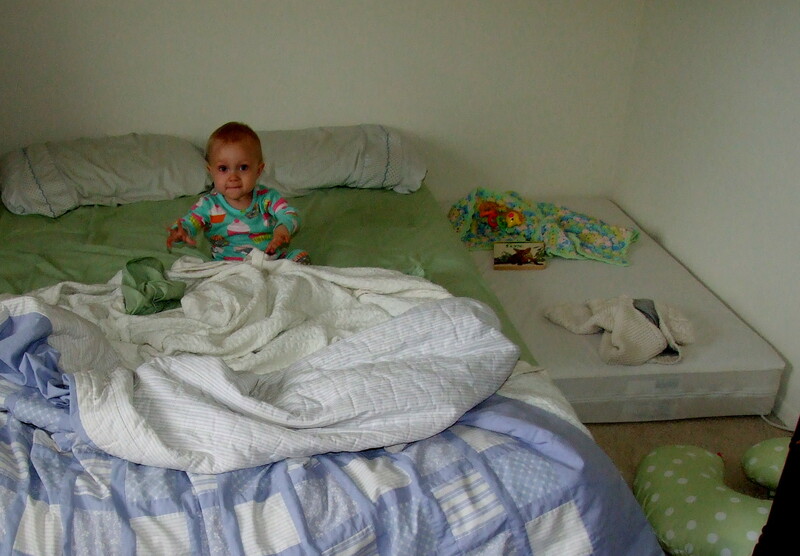 When we moved to Plainsboro, we left the bedframe behind and created a low bed set-up with a crib mattress pushed up next to our bed for baby Miriam. She was about 10 weeks old at that point, and we also stopped using the swaddle when we moved. There are different schools of thought about grouping big changes like that, but for us it worked. She slept beautifully, though she always wanted to be on our bed and not her little mattress. I tried to hold out until she crossed the “SIDS mountain” peak around age 4 months, and then we let her in our bed every night. That doesn’t mean we had a hard fast rule or anything, if I was feeling extra tired or unable to safely bedshare she went on her bed. If she was particularly upset and wanted to cuddle before 4 mos I would let her in bed with us. I’m not worried about getting her out of our bed because I know we’ll do the same thing, as we have with so many other of our parenting decisions. Work towards our goals, gently, without giving up and without going crazy. The AAP recommends breastfeeding until at least 1 year of age and then “longer as mutually desired by mother and infant”. To me that was phrase was gold. As long as bed-sharing is mutually desired by mother and infant, we will do it. Same with nursing, same with everything. I think the most important thing for me was this – do not make hard and fast rules, and do not give up on your goals. It was my goal to keep Miriam in her bassinet at first, and I did it, but we let her in our bed when she really needed to be. I didn’t give up or stop trying, even if I had to settle her a few times before she was really comfortable. If settling her down became more difficult than it was worth to me, in she came with us. My instincts agreed with this gentle and flexible way of sleeping, it worked for us and it worked for her. She trusted that if she needed me I would get her, and I trusted that if I took her in, it wouldn’t become something I HAD to do every night if it wasn’t what my heart felt. For those in it, I say follow your instincts, treat each other gently, and stick to your goals in the long term. In the short term, do what you can to gently work towards them, and don’t drive yourself crazy. ***Disclaimer*** We made our decisions after plenty of research and consulting LLLI’s guide to safe co-sleeping, research from the Notre Dame Mother-Baby Behavioral Sleep Laboratory, and Dr. Sears. Please do your own research and consider consulting a pediatrician about whether this is the right choice for you and your family. It is not possible for every family to practice safe bed-sharing. I am always looking for fun recipes that Bodie will like, and easy foods for Miriam to eat. This sweet side dish fit the bill, and we all loved it! There are so many reasons to use beets. They are delicious and incredibly healthy, inexpensive and easy to grow, and they last a really long time. A lot of people I’ve spoken to are either afraid to try beets, or think they hate them because they have only had beets pickled in vinegar. 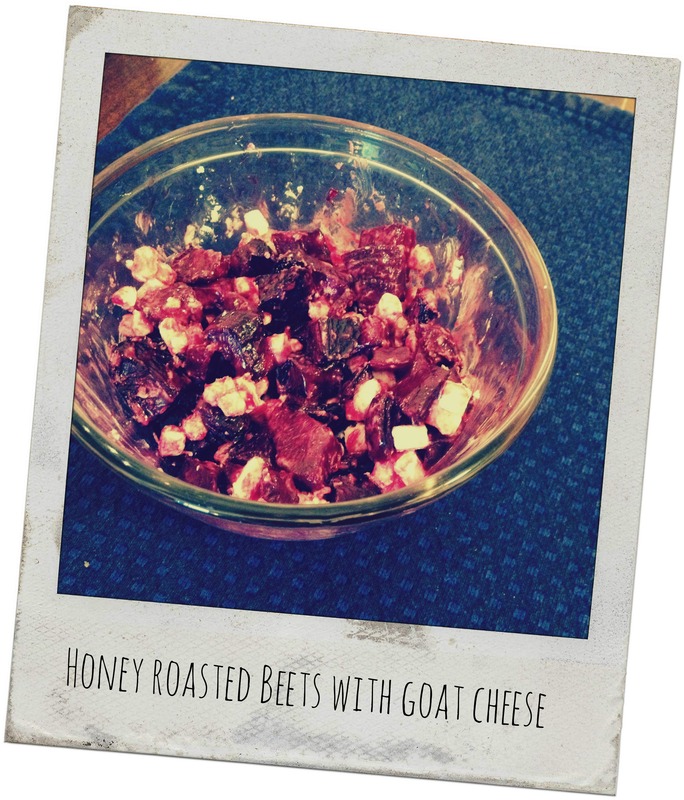 If you’ve never had good beets, consider giving this easy recipe a try. I can’t take credit for the idea of this recipe, I believe that I saw it online somewhere or in a magazine, but I couldn’t find the recipe so I made my own. I made half the recipe since it was just for the three of us, and we had zero leftovers! Preheat the oven to 400 F. Cut the leaves off the beets, peel them and slice them. I wanted to slice them into those beautiful beet rounds but they are really tough when uncooked so I ended up with cubes. Lay the sliced beets out on a baking sheet and give them a good coating in olive oil and salt. Roast the beets for about 20-30 minutes, or until the edges brown. Remove and transfer cooked beets to your serving dish. Add 2 tsp honey and mix, then you can either sprinkle the goat cheese on top or mix it in. That’s it! Serves 4-6 people. I was shocked that my 13 month old toddler loved beets, but she really does! I’d love to hear what kinds of unexpected foods your little ones are eating! Happy cooking! This is the story of Miriam’s birth. I have Polycystic Ovarian Syndrome, which can make it very difficult to become pregnant, so though we were not planning to conceive we were very happy to be having a baby! I was nervous for labor and delivery, but felt ready to be a Mom. I loved the tiny life inside of me, even before I found out for sure that I was pregnant. My pregnancy was not difficult. I had very few problems, some bleeding in the beginning which I was given progesterone for, and some uncomfortable swelling at the end, but I otherwise had a very healthy pregnancy. I am convinced that the progesterone saved my daughter’s life – but that is a story for another time. Thursday night, May 31, 2013, I was watching TV with Bodie. I was 4 days past my due date, and when he asked if we should watch another episode I thought to myself, ‘I should go to bed, I need to save my energy for giving birth’. I was not having contractions, but I must have just known, because I went into labor the following morning. I wish that I had listened to that instinct and gone to bed, but I stayed up late talking to my sister. She was scheduled to come home from school (a few hours away) that Saturday, so that she would be there when I gave birth. I finally went to sleep around midnight or one in the morning. I woke up between 5 and 5:15 am to my water breaking. It came in huge gushes, nothing like what I thought it would be. There was a lot of water in there, and I woke up Bodie and one of us got me some towels. We were staying with my parents at the time, and I went into their bedroom to wake them up but found only my Dad. Bodie eventually went downstairs to the guest room to tell my Mom that I was in labor, since I didn’t think I could handle the stair case with my water leaking. I tried to sleep more, but was unable to fall asleep. I tried to talk to Bodie but he was exhausted, so I let him sleep. While I was laying there, waiting, I was not in pain. Then the contractions started and they really hurt. I got up and went to the bathroom and eventually my Mom came upstairs. By this time it was getting later and I was having strong and painful contractions. I wanted to take a shower and my Mom thought it would be a good idea. She sat with me in the bathroom while I showered just in case and I was really thankful that she was there. In the shower my Mom reminded me to take yoga-breaths, told me that I knew how, and that they would help. This advice probably saved my life, and helped me deal with the contractions that would continue painfully for the next 24 hours. Eventually I got out and Bodie got up and went to the drug store to get some maxi pads for me since my water was so leaky. My Mom was busy trying to call my sister, who was asleep at her boarding school. Eventually she got ahold of someone in the dorm who woke Laura up and she began to make her 3 hour journey home. I stayed in the bathroom and lost my mucus plug, then called the doctors office when it opened. When I spoke to my doctor around 8 am she told me that it was time to go to the hospital. I was nervous about this, but relieved too, because I was curious how dilated I was and hoped from there that my labor would progress quickly. Bodie drove me to the hospital and my parents came separately. Surprisingly enough, the car ride was fine. It took about 15 minutes, and the forward moving motion helped ease the pain of my contractions. We got there and I started slowly making my way to the front door, pausing in the parking lot to lean against a wall for a particularly painful one. A woman who saw me gave me a knowing smile, and I think someone asked me if I was alright or if I needed a wheelchair. I was okay, and I made my way to the volunteers desk who told me that I could go upstairs to Labor and Delivery. We took the elevator up, and it was beautiful, I just loved that hospital. Nature scenes everywhere, and I was practically delirious staring at the abstract art and seeing faces and positive signs from God in the pattern. Once upstairs, we were escorted to a room and I was checked by one of the obstetrician’s in the group I was seeing. She was very friendly, I signed some paperwork. I pointed to the word “episiotomy” on a form, and my doctor reassured me that she didn’t believe in those. She said that I was already 5 centimeters dilated and that I would be having my baby that afternoon! She gave the OK for me to walk around freely with only intermittent monitoring, and eat as much as I was able to. I had a few bites of toast but couldn’t eat much, I was in a lot of pain. In each contraction I could feel my uterus squeezing my baby’s tiny bones, and they were sharp and hard. My nurse was Catholic, I remember this because I thought God had sent her to me. She had curly hair, and smiled a lot. She had daughters too, and I was thankful that we got along so well. I remember a woman with a form distracting me from my breathing, I probably spoke sharply to her but could not respond when I was in the middle of a contraction and she was pushy. The nurse encouraged me to change from my pajamas into a hospital gown and after checking me on the monitors I started doing laps around the hallway. Sometime while I was walking, my sister arrived. I was so thankful to see her but also afraid that she would distract me from my breathing, which was the only thing holding me together. She brought presents for the baby, flowers too, and walked with me talking to me and keeping me company. It was wonderful, it was the best thing anyone could do for me. After a long time walking, my nurse asked if I wanted to be checked again and then go in the whirlpool tub. That sounded like a good idea and I feared that my labor had stalled, because I felt like I wasn’t progressing. I was right, I was still at 5 cm. I decided to get in the tub and reassess after. The tub was awful, it was steamy and hot and I was in a lot of pain and naked in front of everyone it seemed. The nurse asked if I wanted some lavender aromatherapy, and I think that it made me even more drowsy. I wanted to sleep badly but was in too much pain, and in hindsight I realize that the tub, the aromatherapy was a big mistake. Many midwives do not allow women whose water has already broken to be in the tub before they are pushing, because the infection rates are higher. At this point I was ready to talk about epidurals. I felt like a failure and had wanted my natural birth so badly, but after 12 hours of active labor I was so exhausted and in so much pain that everyone was worried that I wouldn’t be able to push. I decided to get checked one more time, and then decide. I was still 5 cm, and I asked to speak to the anesthesiologist to discuss the risks. When he came upstairs, he spoke sharply and said only “well what do you want to know?” and treated me as if I was wasting his time. It felt as if he only wanted to hear yes or no from me, and gave me little information about the procedure. I decided to have the epidural, I was exhausted and afraid that I would not be able to push and end up needing to be cut open. They must have let a nurse-in-training put in my hep lock, I had written “no students” on my birth plan but I left that at home. She stuck me several times and my arm was bleeding all over the place. They started me on an IV too, and I am terrified of needles. At this point though, the needles were welcome in the hopes that they would ease my pain. Getting the epidural put in was very painful. The anesthesiologist was very rude and frightening, he barked at me not to move at all. If I moved, I could be paralyzed or have permanent damage. I stayed as still as possible though the contractions hurt like hell. I gripped the nurses hands and bent over the table, and the needles felt huge going into the area around my spine. The epidural only worked on half of my body. I could feel everything on the other half, and everyone was horrified. It happens they said, but they were so sorry it happened to me. We discussed it and I decided to let the anesthesiologist try again, to administer a second epidural even though I knew he had botched the first. This was at a first rate hospital in a very affluent area, and I trusted that the hospital staff was highly trained and skilled. The anesthesiologist was rude, told me that it might just be my body, that a second epidural might not help. The rest of the staff and my mother, who is a doctor, were fed up with him too by that point, and told him to just try again, one more time. He did, rudely and begrudgingly, and the way he administered the second epidural was just as painful as the first. We were all glad to see him leave, and finally, FINALLY I had some relief from the pain. People muttered that he had done it wrong in the first place, and I was angry but couldn’t focus on that because though the pain was less, I still felt every contraction and since I had the epidural I had to stay in one position, unable to move into ones that made the pain lessen. Hours passed, I’m sure my family got very tired of me. My Dad and sister went home to sleep for a few hours. The doctor checked me again and I had only changed by about half a centimeter in several hours. Too slow, but they were willing to hold off on further interventions for awhile because I still wanted as natural a birth as possible. They had to use a catheter for my bladder since I wasn’t allowed to move from the bed. More time passed, they took my vital signs. I had a small fever. The doctor was trying to let me be in control of my birth as much as possible but she highly recommended that I start pitocin since the chance of infection was so high, and I was developing a fever. I asked them to take my temperature one more time just to be sure, and even though only a few minutes had passed it was much higher. I agreed to the pitocin, and some antibiotics since a quickly rising fever seemed to me to be very dangerous both for me and my baby. The pitocin helped, and things started to speed up, but not by much. Bodie and my mom ordered a pizza, I now was starving and wanted some but wasn’t allowed to eat. They each dozed on and off and I was lonely. I felt like I had failed at trusting God to do things His way, naturally, and I was disappointed and afraid. It still wasn’t real to me that my baby was going to be born, I don’t think it felt real to me until she was finally here. After awhile my body started to push on its own. I wanted to push, I was excited about this part and I let my body do what it wanted to do. It hurt badly, I could feel everything below my waist and asked about that but the doctor and nurses said that I should be able to feel everything, that it would help me push. I stopped pushing for the drugs on the epidural, I don’t remember if they turned it off or not but I definitely felt a lot of pain from the pushing. I didn’t know if I wanted to call my sister back to the hospital or not, originally I had wanted her there for the birth but I was afraid she would distract me. My doctor told me that her sister had not called her, and that she still hadn’t forgiven her. She encouraged me to call my sister and I did. When my sister got there I was starting to get distracted. She kept moving around and my doctor told her to stop, it was distracting. Laura often faints at the sight of blood and she felt queasy, so my doctor yelled at her saying “Today is not about you, this is about your sister. SIT DOWN.” I was surprised but also sort of grateful, and Laura was wonderful the rest of the birth. I was truly thankful that I had called her and so, so, glad that she was there. My doctor was like a football coach, yelling when to push, to do it harder. Some of my pushing was ineffective but eventually I got the hang of it. Bodie helped hold my legs up, so did the doctor and I pushed and pushed. It hurt and I remember lying about whether I was having a contraction once or twice so that I could rest. They wanted me to get her out as fast as possible, I had been in labor almost 24 hours and even though I was having the antibiotics they feared the baby would catch an infection or that I wouldn’t have the energy to sustain pushing and that I would need a c-section. She made me push faster than I would have liked, but I did it because she said to. I think if I had gone slower, I might not have torn at all. As it is, I only tore a little. Bodie said that he could see her head, it looked like “a hairy potato”. He said she was almost here and the doctor yelled at him, saying she was the only one who was allowed to say that. Finally I pushed her head out and the doctor yelled STOP. I wanted to push again, but I stopped, and she soon said OK again. As soon as she did I gave one last huge hard push and my baby’s shoulders and body flew out of me. Miriam cried immediately, which I was thankful for. I was so glad that the pain was over. I kept having contractions and they kept hurting, I asked when it would stop, I was in agony still. When Miriam was born a huge gush of blood followed, my Mom almost passed out. Everyone said “whoa!” and my doctor called for more pitocin to stop me from hemorrhaging. I birthed the placenta, I’m not sure if they had Bodie cut the cord before or after but I had asked them to wait until it stopped pulsing and they did wait a good while. More nurses had come in when she was about to be born, NICU nurses, perhaps because of my fever. Bodie held her, they weighed her and she had her first meconium poop. I asked for her to nurse her right away. They let me hold her but didn’t let me put her straight to my breast. They said “she doesn’t know how yet” and made me wait until after they took her stats. I wanted to fight, but I was in too much pain and still contracting. I just wanted it to be over. 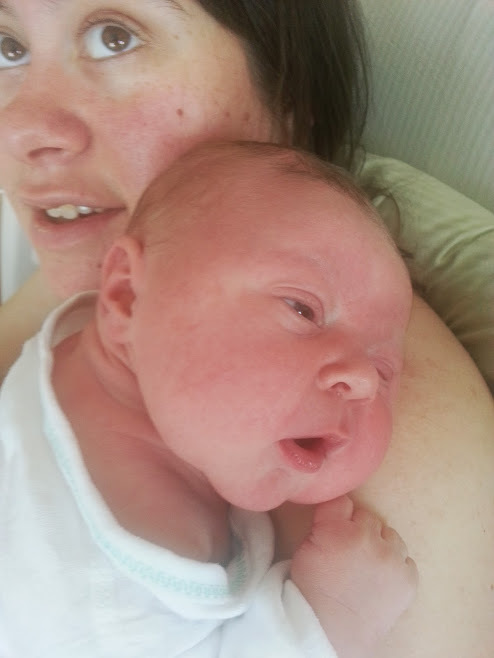 Eventually, probably within half an hour, they did let me nurse her and she nursed for almost two hours. She was brilliant at it, I stayed there with her enjoying my new baby and practicing our latch. They called my Dad in from the waiting area and he got to hold her. At some point Bodie found out that his parents were flying in and would get to meet her later that day. She was born June 1, 2013 at 5:15 AM. She was 8 lbs 9 oz and 21 inches and wonderfully healthy. On the last day in the hospital we named her Miriam Rose, and I love her so much. I’ve been meaning to do a post about Miriam’s first birthday and the crafts that I did for that, but am just getting around to it a month later! We chose to do a “rose” themed party, and here are some of the (extremely easy) crafts that I did! 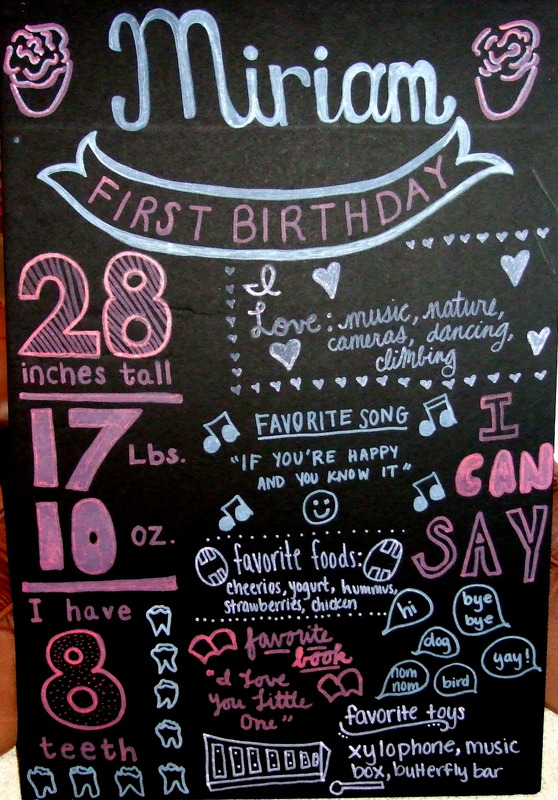 This first birthday chalkboard COULD have been very hard, but I decided not to be finicky about it. I got chalk markers and drew on a black poster board freehand. The only thing I did in pencil beforehand was draw a line under her name to make sure it would be straight, and I looked at what her name looked like in a cool font but just recreated it by hand. 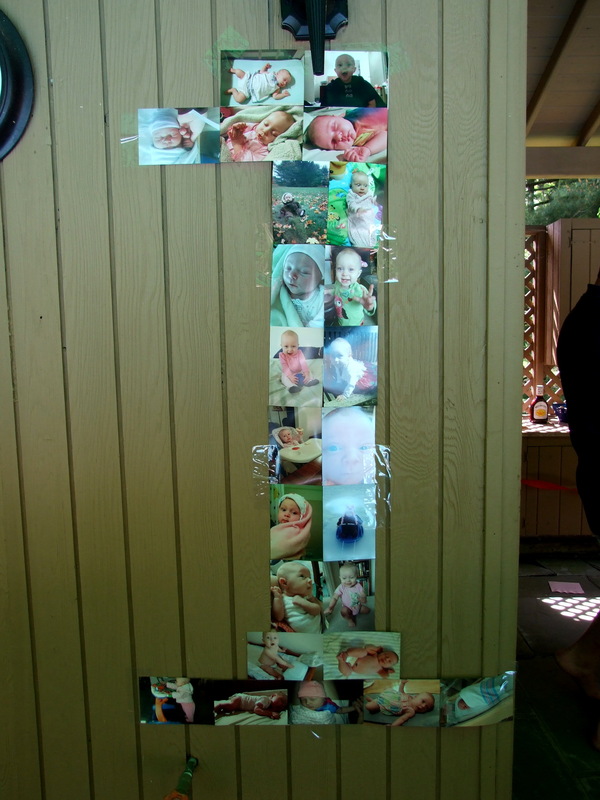 This photo number one craft was very simply too, and I love how cute the number one looks! I used all kinds of baby pictures and just followed this pattern of which were horizontal and which were vertical. I recommend printing extra pictures in both directions so you can play with your design and which ones go next to each other. It’s easy to get too many photos of your baby in the same kind of poses! I laid this all out on the floor and then taped the backs of the pictures together. Again, if you turn your photos over to tape them, make sure that when you flip them over you’re getting the shape you want and not a mirror image! Out of all the birthday crafts, this one took the least amount of time. 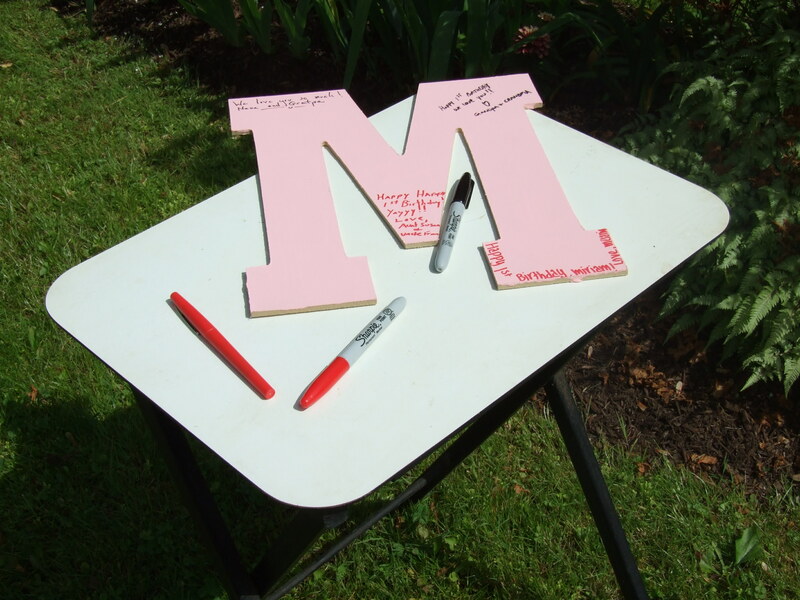 I took a plain letter “M” and painted it, then set out two colors of permanent marker for people to sign or write a little birthday note to Miriam. This could also be done for a baby shower or bridal shower with your new initials. The final letter can be hung on a wall, propped up on a shelf, or just saved as a memory of the day. Here they are! 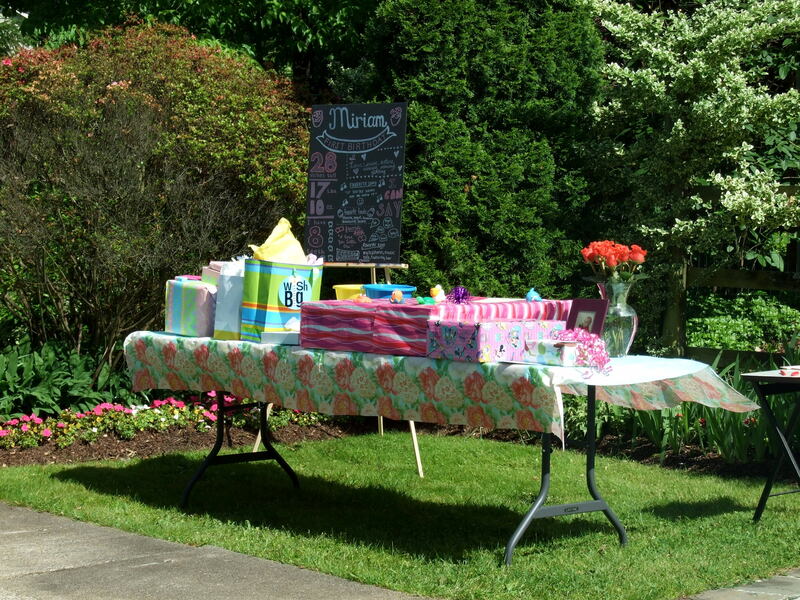 Our party was outdoors, so I used an easel to hold up the first birthday chalkboard and placed the “M signing station” near the gift table. The photo number one is hanging on an outdoor wall (not pictured), but I liked having the different crafts in this section and thought it came together really well!